The Heartland Bank routing number 104901597. How can I be assured that my financial information is secure? Maintaining your financial privacy is of utmost importance to us. In order to accomplish this, we have implemented multiple security features. For your protection, our Online Banking service requires the use of a web browser with a 128-bit technology. No. There is no fee to access your accounts through Online Banking. You can view your account balances, transactions or make transfers free of charge. Once you have successfully logged in, all accounts associated with your access id and password will be categorized in the account list. Click on the account number to view a single account. How do I skip answering my security question on every login? 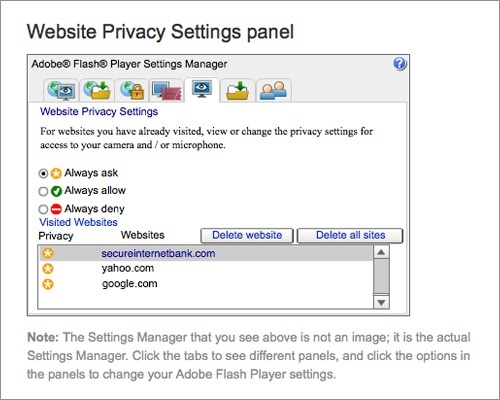 Navigate to the Adobe Flash Player Settings Manager Website by clicking here. In the panel to the right there will be a list of “Visited Websites”. Search for the domain name secureinternetbank.com, select it, then click the “Delete Website” button, then click the “Confirm” button to remove the Flash Object. After deleting the FSO object, You will need to delete all cookies in your browser. You will be challenged with your security question the first time you login. Once you have passed this step you can select to register your computer to avoid this step in future logins. If you are still unable to register your computer, please contact an associate at your local branch for further assistance. You can view any account that has your Social Security Number listed as an owner of an account. If you have any questions, please contact a personal banker at your favorite location. Are there any cut-off times for Online Banking? The Service is available 24 hours a day, seven days a week, except during maintenance periods. Payments, and transfers must occur by 4:00 p.m. Any payments or transfers after 4:00 p.m. are posted the next business day. What information will I be able to obtain with Online Banking? To establish a one time transfer, click the “Express Transfer” button. Chose the account the transfer will come from and go to and enter the amount in the amount field. Then click Next. For a recurring transfer open the account the transfer will come from and click the “Transfer” button. Chose the type of transfer you wish to perform and follow the prompts. An Insufficient Funds message will show up next to the confirmation number if funds are not available to complete the transfer. How do I change an existing transfer? Click the “Transfers” button then select the transfer you want to change from the “To Account” column of the list provided. Then simply update the information you want to change and then click the “Update” button to complete your request. How quickly will a transaction I make display itself on-line? Online Banking is a real-time interface to your account the transaction will be immediately viewable with Online Banking. Transferred funds will not be available for withdrawal on your ATM/VISA Debit until the next business day. A personal computer with Internet access is all that is required to get started. For your security, you will need an Internet browser with 128-bit encryption ability. Such as Microsoft Internet Explorer 7.0 or greater. Online Bill Pay is a service you may sign up for that allows you to use your Internet-enabled device to pay bills and in some cases receive bills electronically. Payments are posted against your balance available for withdrawal, as defined in the bank’s Funds Availability Policy. The charge for On-line Bill Payment is in addition to any other fees and charges that apply to your account. To begin using Bill Pay, you must first log into your Online Banking account. Once logged in, click the "Bill Pay" tab located in the main navigation bar at the top of every page of Online Banking. This will take to you Geneva State Bank's Online Bill Pay site. If your phone number is not entered in the GSB computer system, it will prompt you to enter your home phone number. If your phone number or any other information on you bill-pay profile is incorrect, please call 402-759-3114 and ask for On-line Bill-Pay Assistance. If your e-mail address is not entered in the GSB computer system, it will prompt you to enter your e-mail address. Notice: Immediate payment may be made to some national billers. Other billers, please allow 2-5 days. Local merchants, please allow up to 7 days. Verify the information on the next screen and click on “Submit Payments" button. You will receive a ‘Welcome’’ letter by mail from GSB Online Bill Pay (Check-Free) confirming your Bill Pay status. You will receive an e-mail containing address confirmation from GSB Online Bill Pay (Check-Free) at the e-mail address listed in ‘My Profile’. Please follow the instructions to confirm your e-mail address. If you would like to add an additional checking account for Bill Pay, call 402-759-3114 or 800-759-3119 and ask for Online Bill Pay Assistance. There is a message notification line at the top of the home screen of Online Banking. Please check this with each log-in session. Can I set up reminders with Bill Pay? Receive an electronic version of a bill: Your reminders automatically appear in the Bill Reminders section of the Payment Center. Set up automatic payments for a bill: Those payments automatically appear in the Pending Payments section of the Payment Center and the Payment Assistant. You can also set up e-mail reminders to notify you when your payments have been sent and when bills are past due. E-mail reminders can be associated with any of your bills, including electronic bills and automatic payments. You can select which bill-related events you want to receive e-mail reminders for. Some e-mail reminders contain links that you can click to view and pay your bill. Can I set up automatic payments with Bill Pay? Yes. If you receive an electronic bill in Bill Pay, your biller may let you pay it automatically. You can select the amount and date options according to your needs. If the amount due for your bill varies, you can set up bill reminders to alert you to pay your bill. The bill appears in the Bill Reminders section of the Payment Center for a certain number of days before the due date. You can check the reminders to ensure you're making the payments on time. How do I know if the bill is paper or electronic? You can receive some of your bills online in Online Bill Pay. You can view and pay these bills at the Payment Center. Your biller may also offer the following features as part of your electronic billing service: receive your electronic bill through e-mail, pay your electronic bills automatically, allow you to have a different address, known as your service address, where you receive your services. Some billers stop sending you paper bills when they start sending electronic bills. For these billers, you must agree to receive only electronic bills to activate your service. Other billers continue to send paper bills in addition to your electronic bills. Some billers let you choose whether you want to receive just your electronic bills or both electronic and paper bills. How can I start receiving eBills? In Biller Name, select the bill you want to get online at On-Line Bill Payment. Type the information required by the biller. Some billers may require information such as the last four digits of your Social Security number to verify your identity. The biller may also require you to enter your account number again. Other billers may require the information you set up to access your account online at the biller's Web site, such as a user ID, account number, or password. Tip: If you must enter your account number, be sure to enter it exactly as described on this page. If your service address appears on this page, verify that it matches the address where the biller provides your service. Click “Change” to make any changes to match your billing records. If the biller lets you choose whether to receive both electronic and paper bills, or if the biller offers a trial period, select your bill delivery options. If the biller's Terms & Conditions appear on this page, review the information and select the box to indicate that you've read and agree to them. Click “Add Feature”. A message will inform you that your request to add an electronic bill has been sent to the biller for approval. The rest of the page will clear allowing you to select another bill. When you start receiving electronic bills, an electronic bill icon appears next to the biller name in the Pay Bills section of the Payment Center. You can also find electronic bill information in the Payment Assistant. You can click the electronic bill icon, or any of the eBill links in the Payment Assistant, to view and pay your bill. The bill also appears in the Bill Reminders section of the Payment Center as soon as Bill Pay receives it from your biller. The reminders list shows the amount due and the due date from your bill. What if I get a new phone or change phones? Mobile Banking is tied specifically to the phone you originally enrolled with. If you get a new phone or change phones you will need to have new links sent to this phone in order to download the Mobile Banking Application and/or to access Mobile Web Banking. To get these links, you will need to log into your Online Banking account. Click on the "Options" tab in the main menu. Scroll down and click on the "Manage Devices" link in the Mobile Banking enrollment section. What is Business Banker Online Services? Heartland Bank Business Banker Online Services is our Internet business banking product that allows business clients 24-hour, real-time access to their accounts. By simply logging on to Business Banker Online Services from www.genevastatebank.com, business clients can view account information, move funds, check transactions, view check images, initiate stop payments and wire transfers, and more including ACH transfer capabilities. What does Business Banker Online Services cost? Business Banker Online Services are available in four different plans, Level I, Level II, Level III and Level IV. For more information about pricing, contact a Personal Banker at your local branch, who will work with you to determine which plan works best for your business. Who can access Business Banker Online Services? Business Banker Online Services are available to any Heartland Bank client with a business account. Businesses can also grant full or limited use of Business Banker Online Services to employees. How do I sign up for Business Banker Online Services? You can sign up for Business Banker Online Services by contacting a Personal Banker at your local Heartland Bank. We will work with you to establish the appropriate plan and service levels for your individual business needs. How do I get an access ID and password for Business Banker Online Services? Access IDs and passwords will be given to you once your enrollment applications have been approved and account setup is complete. How do I access Business Banker Online Services? From the homepage, click on the drop down menu in the Secure Online Banking section at the top of the page. Click on the "Business" option in the drop down menu. Enter the Access ID you were given and click submit. Enter the Password you were given and click submit. How do I exit Business Banker Online Services? When you have completed your Business Banker Online session, it is recommended that you click logoff at the top of the screen to terminate your session. However, if you forget to log off, the system will terminate your session after 15 minutes of inactivity. If you wish to continue your session, just return to the log on page and enter your access codes again. As an additional security precaution, you should also close your browser after your online session and clear your browser’s history. Business Banker Online Services give me "real-time" current account information. What does that mean? Unlike other financial institutions that update information in “batches” one or two times a day, Business Banker Online Services provide account balances and transactions for savings and checking accounts that are generally current and will reflect transactions made during the day as they occur when using Telephone Banking or other Business Banker Online Services. This includes transfers, deposits and withdrawals, and ACH transactions. Balances and available credit information for loans reflects real-time activity, but only under current day activity. CD balances are generally current as of the end of the previous business day. strong>How much transactional information is maintained by Business Banker Online Services and for how long? You can access transactional information for your any statement within the last 18 months. Can I transfer funds from/to other financial institutions using Business Banker Online Services? Yes, with Level II, III, and IV Business Banker Online Service plans, you can initiate a wire transfer or establish an ACH Funds Transfer. Can I approve all transfers initiated by employees over a certain amount? With Business Banker Online Services you can specifically and individually define access levels, limits, and capabilities of each employee-user for transfers as well as many other Business Banker Online features. When will advances, payments, or transfers made through Business Banker Online Services be credited or debited from my business account? Your Business Banker Online Services agreement will contain the specific information. How do I add an account in Business Banker Online Services? If you want to add another account, simply contact a Personal Banker at your local branch. Can I view check transactions in check number order? Yes. Once you are in an account screen, simply click Transactions and then either Previous Statement or Current Statement. Once the transactions are displayed, click on the Transaction Number column and it will sort in ascending order. Click the heading again and it will sort in descending order. How can I view an image of a check? To view the front or back of a check image, click Transactions and then either Previous Statement or Current Statement. Once the transactions are displayed, click on the check number under the Transaction Number column heading. What should I do with the confirmation numbers I receive after I initiate a transaction such as a transfer? You may either print the screen or simply make a note of the confirmation number for future reference. If you have a problem with one of your transactions, you can reference the confirmation number when you speak with a Heartland Bank representative. What is the difference between Personal Identification Number (PIN) based and Signature-based transactions? A PIN-based transaction occurs when you have to enter your 4-digit PIN when you purchase an item. The money typically withdraws from your account the same day. A Signature-based transaction occurs when you have to sign or don’t have to sign a receipt. Signature-based transactions take 1-3 business days to subtract from your account. Both require sufficient funds at time of purchase in order to work. How much can I spend with my debit card in one day? Debit Card purchases cannot exceed $2,500 in a 24-hour period. Limits are designed to protect you and to help eliminate debit card fraud. What do I do if I lost or forgot my Personal Identification Number (PIN)? If you have lost or forgotten your PIN, you will need to call your bank branch. An associate will then request your PIN from your card company. You will receive the new PIN via mail. If your Debit/ATM Card is stolen or lost you must notify us immediately. What if a transaction was made without my permission? If your Debit/ATM Card was used without your permission and you see an unauthorized transaction on your account statement, please call 1-800-759-3119 during normal business hours. Why can’t I use a signature-based transaction at some merchants? A recent court settlement with VISA allows merchants to choose whether to accept Debit VISA (VISA check cards) as a signature-based transaction or not. Be sure to ask the merchant beforehand to avoid any inconvenience. Can I change my Personal Identification Number (PIN)? You are unable to change your PIN unless you acquire a new debit card and new debit card number. What do I do if my VISA credit card has been lost or stolen? If you believe your VISA has been stolen or lost or a transaction was made without your permission, you must notify us immediately. Destroy your old ATM/Debit or check card and begin using your new card today. Memorize your Personal Identification Number (PIN) Do Not write it on the back of your card or keep it with you. Never give out your PIN to anyone. I never activated my card. What now? You can activate your card whenever you need, until it expires. You can see the expiration date on your card. If at the time your card expires and it hasn't been activated, Heartland Bank will not reissue another card. A mortgage loan is money given to you by a financial institution to buy a house. It requires a contractual agreement that you’ll pay back the loan with interest in specified monthly payments over a stated period of time. You can choose your payment term-the longer the term, the lower the monthly payment, but you’ll pay more in total interest. Any one of our Personal Bankers will be happy to answer any of your questions, help you select the best financing for your needs, prepare estimates of your closing costs and down payment, calculate payment schedules, and help you determine what price of a home you can afford. Generally, lenders want your monthly payment, including taxes and insurance, to be 25-30% of your gross monthly income. Your Personal Banker can help you determine what price of a home to shop for by reviewing your income, debts and credit. You can also apply for a pre-approval where the lender approves the loan before you find a new home. Pre-approval makes your offer more attractive to a seller. When you locate a home, contact one of our Personal Bankers who will assist you in filling out a loan application. The following pieces of information are needed for your loan application. Residence addresses for past two years. What happens after I apply for a mortgage loan? After you have applied for a loan, the information you have supplied will be verified and a credit report on you will be completed. An appraisal will be performed on the home you are purchasing to determine its market value. When all the information is collected, it will be reviewed for loan approval. Closing costs are up-front fees you pay the lender when taking out a mortgage loan. These may include points. Points are a one-time charge you pay the lender to buy a lower interest rate than the current one. Each point equals 1% of the amount you are borrowing (i.e., if you borrow $90,000, one point costs you $900. Be sure to ask how many points you’ll be charged because you must pay them at closing. Actual rate you pay during the life of the loan, including interest, points and certain closing costs. An official valuation of market value of a house. Have the house you want to buy appraised so you don’t pay more than it is worth. Transfer of ownership of a house when you sign loan papers and deed is recorded. Report on how timely you pay your bills, debt you are carrying, and your current monthly payments. Credit history is important when a lender considers your loan application. Interest rate is locked in for the life of the loan, so future changes in interest rates won’t affect it. Costs you must pay to lending institution for money you borrow. To get a set interest rate when applying for a mortgage and not waiting until you close. Usually available for up to 90 days before closing. Part of the closing costs a lender may charge. One point equals 1% of the amount borrowed. Provision permitting you to pay off mortgage early to reduce interest costs. Some lenders charge a penalty for prepayment. Amount you borrow, excluding interest and points. If you don't see instructions below for your specific version or browser, search your browser's Help menu for "clear cache". If you're unsure what browser version you're using, from the Help menu, select About [browser name]. InInternet Explorer and Firefox, if you don't see the menu bar, press Alt. When assisting a customer you may need google how to step them through clearing cookies and cache for their specific browser version. When troubleshooting issues with any web site, after clearing your browser's cache and cookies, exit your browser completely before attempting to access the site again. In Windows, close all your browser windows; in Mac OS X, quit (Command-q) your browser. Each time you access a file through your web browser, the browser caches (stores) it. By doing this, the browser doesn't have to newly retrieve files (including any images) from the remote web site each time you click Back orForward. You should periodically clear the cache to allow your browser to function more efficiently. Download instructions for clearing your browers's cookies, cache and history here. You should always have the most updated version of your browser installed on your computer. The browser you are using can affect your overall web experience as well as the safety of your device and your personal information. As device manufacturers release new browser versions, they stop supporting and fixing old browsers. You may wonder, “Why on earth would they stop supporting the browser I still have on my device?” This is done to improve the overall user experience. As technology improves, companies often rebuild their browsers from the ground up. The old browsers simply don’t have the capabilities to support the new features and standards. Older versions might also utilize poor or outdated coding that is vulnerable to security hackers and cyber criminals. So instead of forcing you to buy a new device, manufacturers provide free software updates to your existing devices. Most of the latest devices update certain software programs automatically. However, many of the older devices out there aren’t yet set up to make automatic updates. Although the company may have released an updated browser version, you may still be using an older version. Why do I need to update my device's operating system? Just as with updating your browser, one of the main reasons to updating your operating system is to have the latest level of security. Older software will continue to have the same bugs and exploitable holes in the code that allow hackers and cyber criminals to get access. I have Windows 7, Microsoft Vista or Microsoft 2008 and I can't access my Online Banking. Why? As of May 7th, 2018, the company who hosts our online banking platform, Fiserv, discontinued Transport Layer Security (TLS) 1.0 and 1.1 due to security implications. Most of the browsers and operating systems auto-converted to the necessary version of TLS for increased security, but some of the older systems including Windows 7, Microsoft Vista and Microsoft 2008 are too outdated to convert. Update your device's operating system. Ensure TLS 1.2 is checked, if not check TLS 1.2 and select Apply, OK.